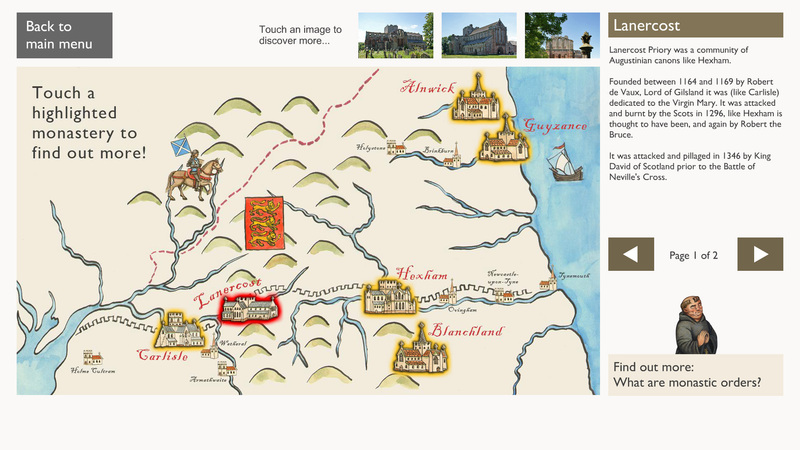 Hexham Abbey began life as one the ground-breaking continental style churches built by St Wilfrid in the 7th century. 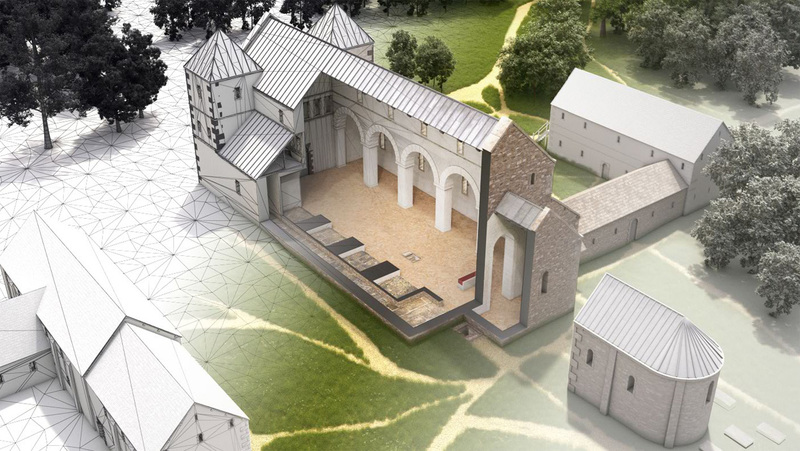 Still retaining its extraordinary Anglo-Saxon crypt, constructed from re-used Roman stone and built by Wilfrid to evoke both the catacombs of Rome and the tomb of Christ, the abbey today is a fascinating amalgam of the many phases of its long history. 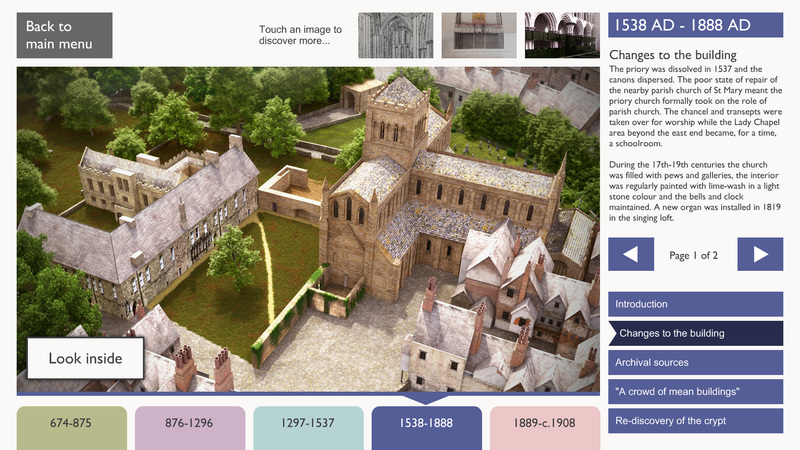 This collaborative project sought to present the abbey's rich, but largely hidden, history to visitors in a way that was engaging, thought-provoking and fun. 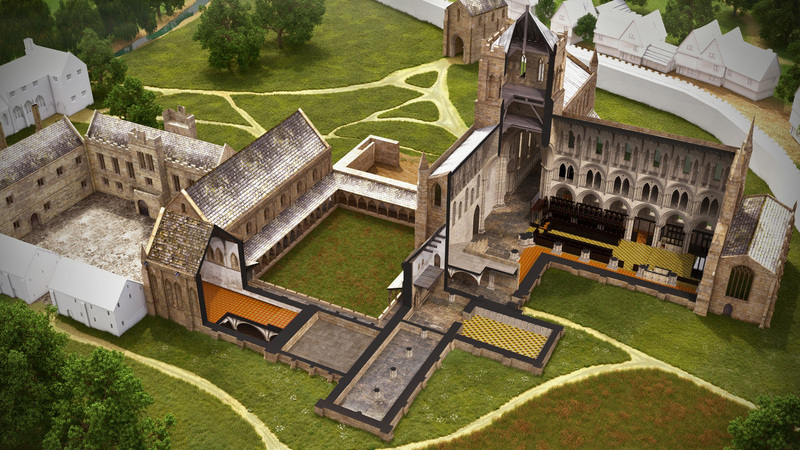 The outputs would form a key part of the abbey's new visitor centre, which opened in 2014. 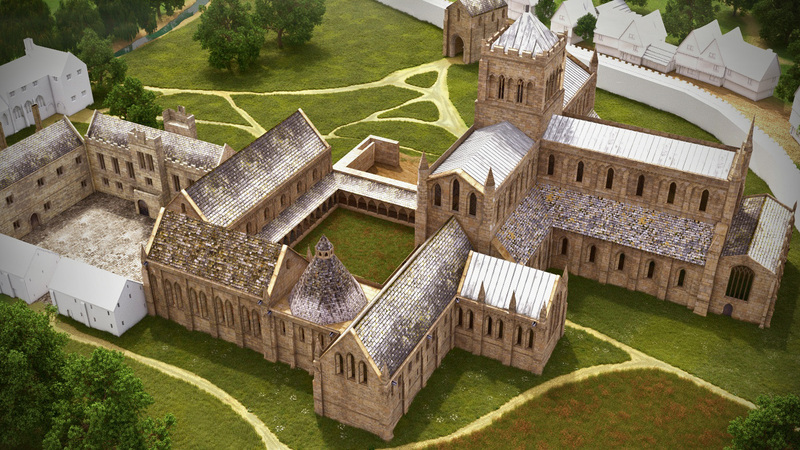 A primary element of the project was the creation of a digital model that charted the abbey's development from Wilfrid's original church to the present day. 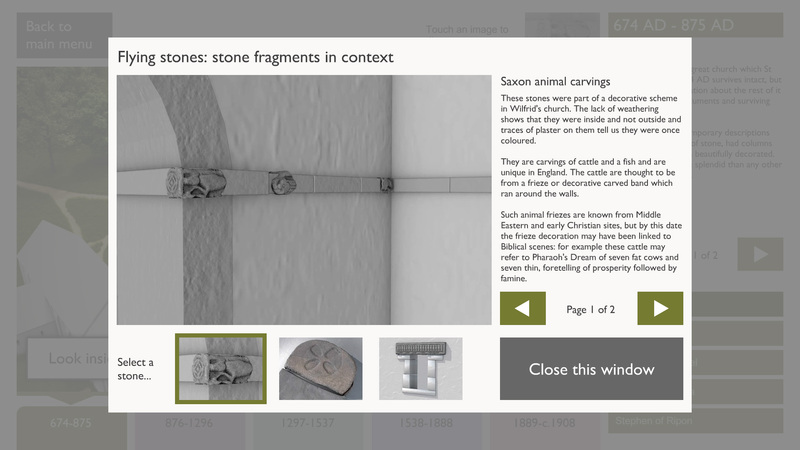 The visualizations were informed by current archaeological and historical evidence, but also sought to present this information (including the many inconsistencies!) in a way that would encourage visitors to explore and question for themselves. The result was a touchscreen composed of modelled phases and layered information that could be explored as varying interests dictated. 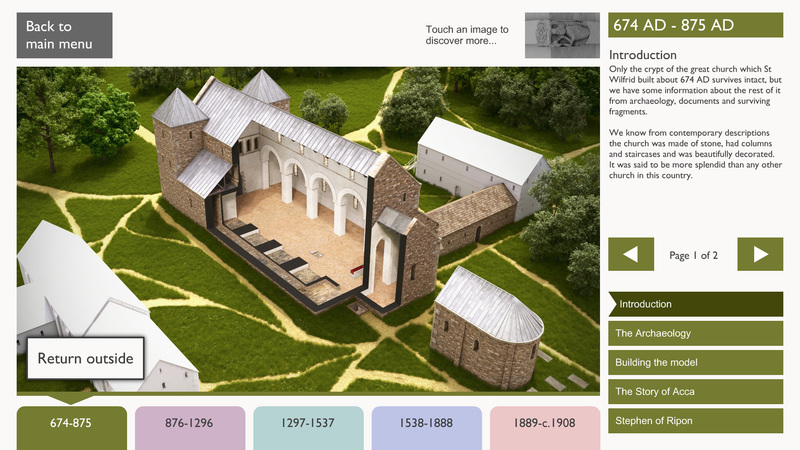 Alongside the developmental models were sections presenting early carved stonework (also on display in the visitor centre) in their original historical context, a closer look at the Saxon crypt, and contextualising information that connected the evolution of the abbey with its role in the history of the wider area. 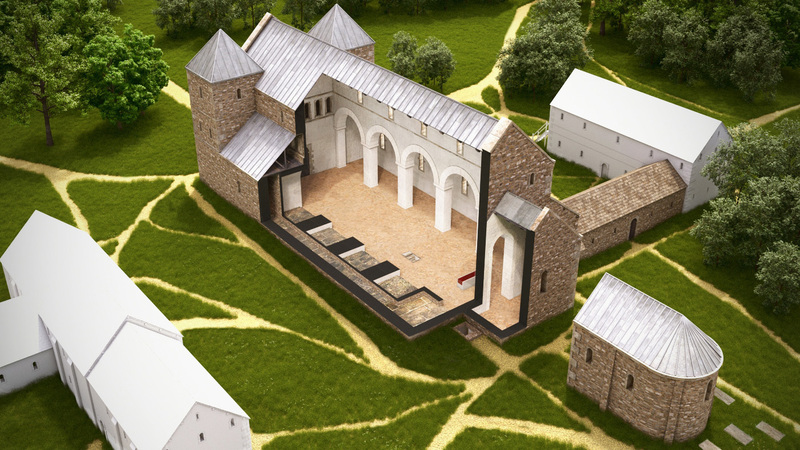 The reconstruction of Wilfrid's early church presented an especially difficult challenge. 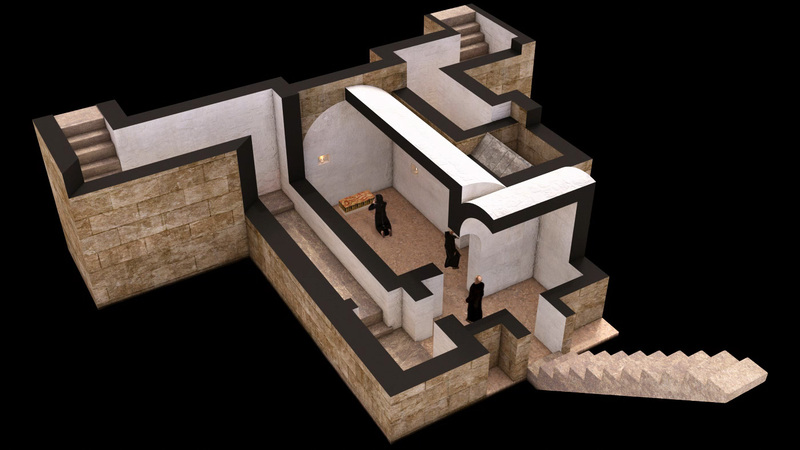 Although aspects of this complex were tantalisingly described in contemporary or early sources, little hard evidence was available and many decisions relied on the ambiguous archaeological data. The project was fortunate to have the advice and input of Professor Richard Bailey and Professor Eric Cambridge, whose expertise was brought to bear on the initial reconstructions that utilised comparative research on buildings from continental Europe. The result is an interpretation that stands up to academic scrutiny, but which also adds meaningful questions to the debate. The process of creating a 3D digital model is an unforgiving one, and details that can be elegantly elided in a written piece are brought into sharp focus when trying to provide physicality and appearance to something that no longer exists! An good example are the 'many coloured columns' or 'twisting staircases' mentioned in early sources: where were they, how many, how tall, and where they staircases lead? Further excavation and research will undoubtedly add to our knowledge, and perhaps challenge or refute our work. 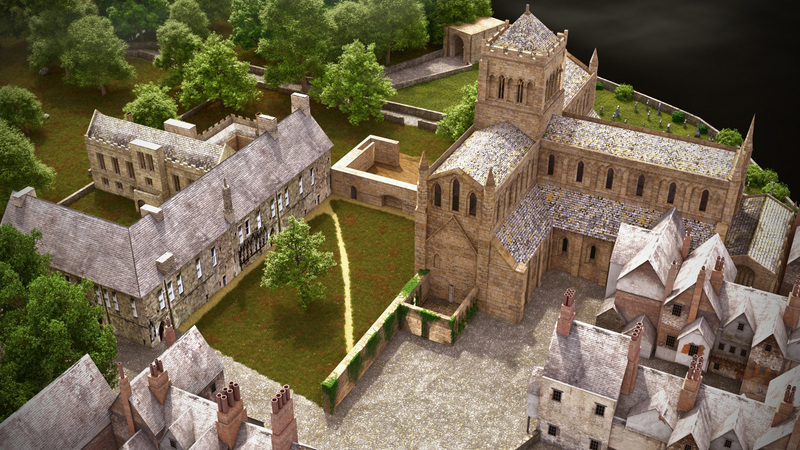 However, the process of visualizing St Wilfrid's 1300-year-old church was a surprisingly moving one, and reinforced just how special Hexham was and is.